Maybe this week has me jinxed, but I failed at three tutorial attempts in the past several days. After poor dye jobs on a scarf and dress I recently sewed, I'm going to invest in some bleach and start fresh next week. Fortunately, this guy turned out exactly as I hoped. 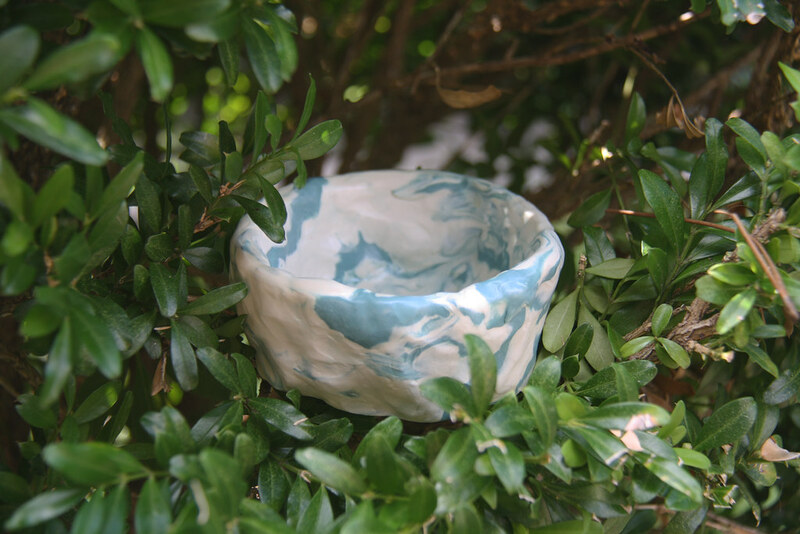 Ceramic pinch pots have been on my wish list for awhile now, and I recently discovered a way to make them at home using old-fashioned, easy-to-find polymer clay and a coat of sealant. All you need is clay, an oven, and some polyurethane to finish. Supplies.. about 250 grams of oven-bake clay for a 3 to 4 inch pot and some fast-drying, clear polyurethane for a topcoat. I used Minwax Clear Satin to give my project a slightly glossy finish. 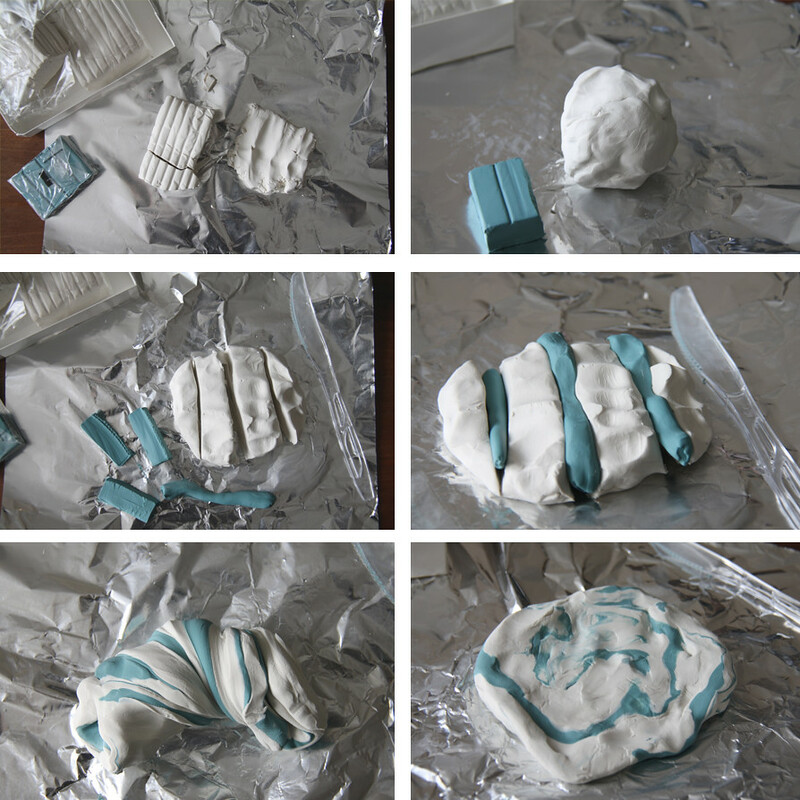 Wash your hands and lay out some aluminum foil to roll your clay on. 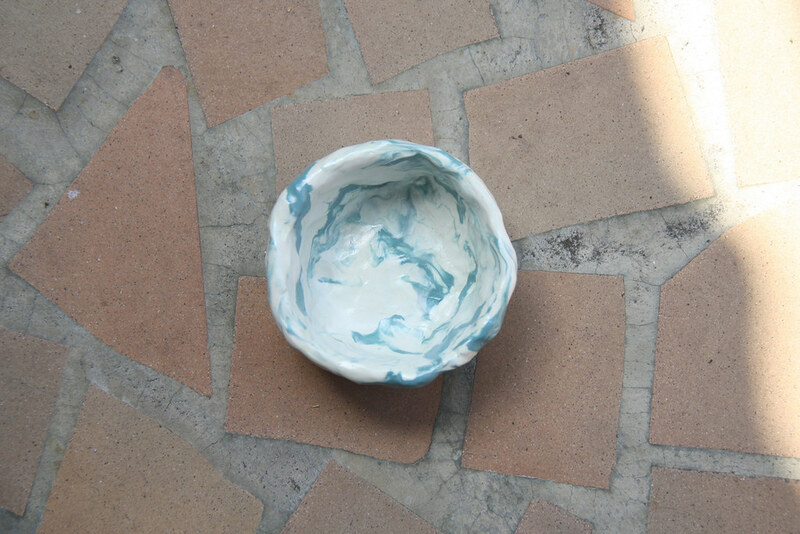 Don't use an unfinished surface to work with clay (it will leave stains). Work your clay - knead it until it's soft and pliable. If you're interested in marbling your clay, use an ounce (or about 30 grams) of an alternating clay color. Break both colors of clay into four pieces and line them up one color after the other, pushing them together and twisting the clay into a spiral shape. Flatten it out. Does it look marbled? 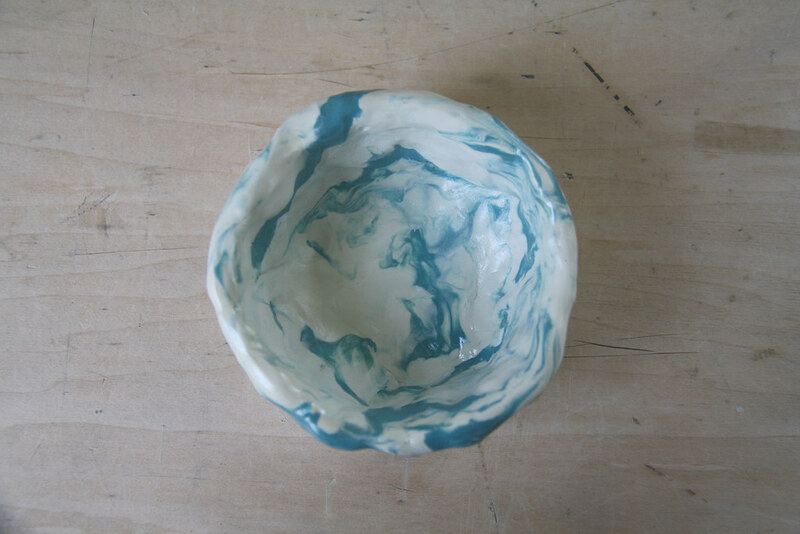 If it does, set about forming your pinch pot by manipulating the edges upward. If it doesn't, keep working it. Don't overdo it, or the colors will blend too much. Preheat your oven to 275 degrees Fahrenheit, then place your pot on a foil-lined baking sheet and put in the center of your oven. Bake at 15 minute intervals until done - for my pot, it took about 25-30 minutes. Watch it carefully! It's easy to over-bake the clay, which will result in brown spots. If you touch the clay and it feels firm, it is done (about 15 minutes per 6mm of thickness). 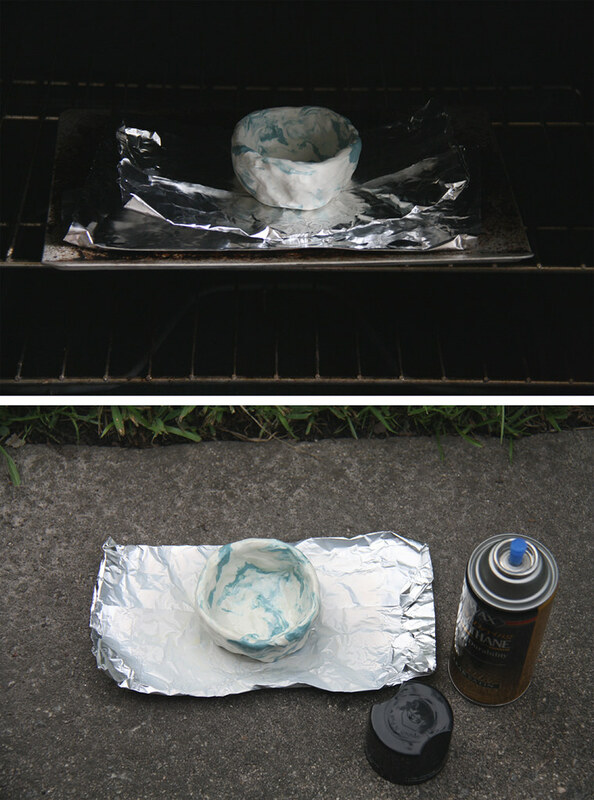 Allow your pinch pot to cool, then take outside and spray evenly with polyurethane. 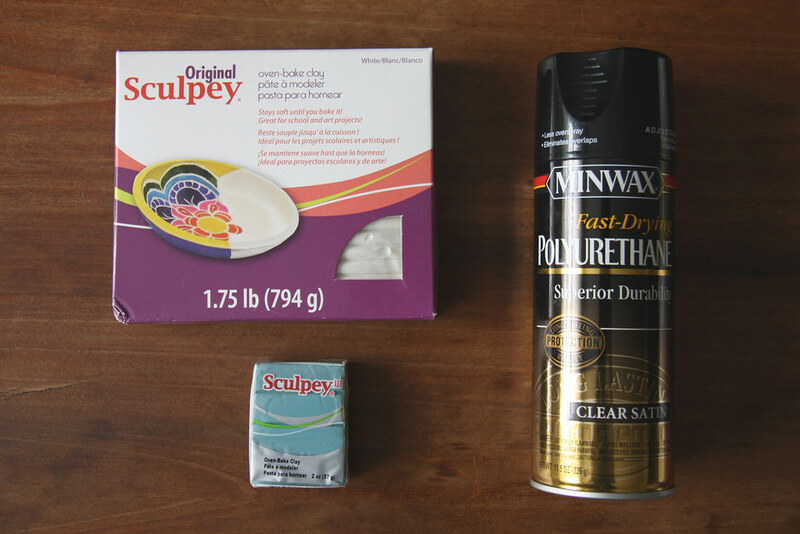 On your first coat, spray lightly. Wait until it's dry (a couple hours), then spray again until you have your desired sheen. Give your pot a day to fully dry before use. 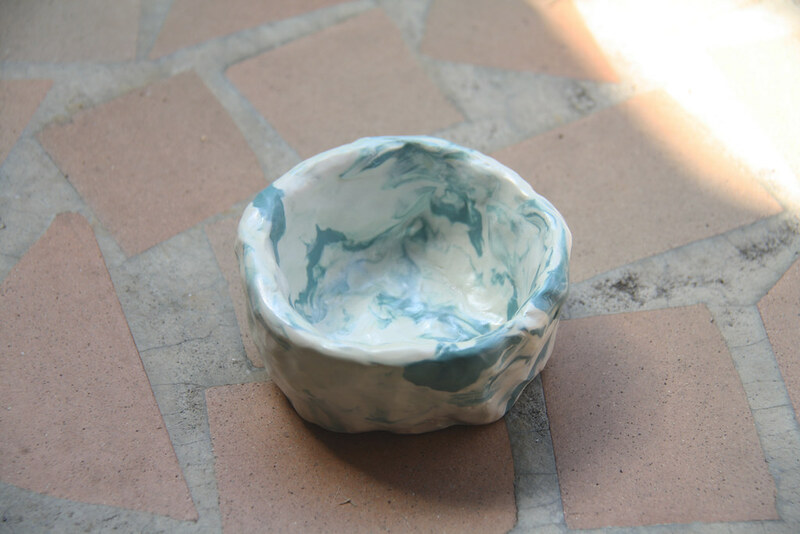 That's all for this week's DIY - a great piece of pottery for holding knick knacks, jewelry, art supplies, you name it. If you try this at home, please share your results below.. and have a great holiday weekend!